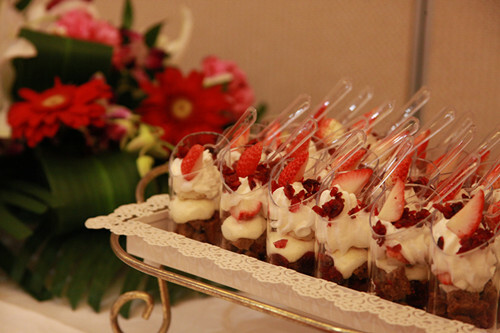 On December 14, 2015, MZMC organized a U.S. Cranberry Chinese and Western Culinary Innovation Competition in the Sunworld Dynasty Hotel in Beijing. More than 200 guests from 130 organizations, including representatives from the media, chefs of major restaurants and hotels as well as others working in the food and beverage industry, witnessed the competition by 14 teams of chefs in making new, creative Chinese and western cuisines using U.S. cranberries. At the beginning of the event, Bruce Zanin, Director of Agricultural Trade Office at the US Embassy in Beijing, was invited to give a welcome speech. Mabel Zhuang, CMC’s China representative, delivered a talk on cranberries’ unique health benefits and their unique harvesting methods. The audience was also informed of the CMC program for encouraging bakeries to develop new recipes by providing the latter with free samples of cranberry products. These samples would include dried whole cranberries, soft & moist sweetened dried cranberries, intermediate moisture cranberries and sweetened 1/4 diced dried cranberries. During the morning session, Mr. Diego, the executive chef for Regent Hotel Beijing, demonstrated the versatility of cranberries as an ingredient in creative recipes by making nine different Chinese and Western food items such as cranberry lollipops, cranberry duck dumpling, cranberry caviar and fried cod fish with cranberries. He also shared his experience of using of cranberries in their different forms – sauces, powder, and foam. This is the first time that CMC has hosted such a high standard competition among professional chefs from four- and five-star hotels as well as famous brands of Chinese restaurants in Beijing, Tianjin and other nearby cities. Based on the success of this event, MZMC plans to conduct similar events in the future to promote usage of cranberries in the food and beverage industry.